#71 "Empire of the Petal Throne, Shockwave, Ringworld"
Analysis and strategy for Shockwave. 14 pages of capsule reviews. 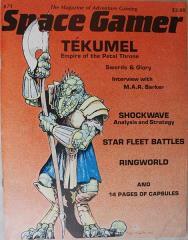 Focus on M. A. R. Barker with an interview and spotlight on his Tekumel. In the Letters section, A. Eric Dott emphasizes the importance of calling Avalon Hill "The Avalon Hill Game Company" to avoid future litigation.